Here are some more photos from inside the new stadium. Looks like they are now testing the main video boards beyond the center field wall. They are working on the scoreboard, suites, the clubhouse, and it seems like they are putting on some of the finishing touches. Remember..the stadium is going to be turned over to the Yankees on Feb. 17th. Thank WCBS880 for some of the photos. 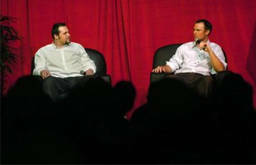 Joba Chamberlain and Jon Lester were at the Sacred Heart University yesterday.They spoke to an audience filled with mostly Yankees fans, and talked about what was going on in their lives. Jon Lester spoke out about overcoming lymphoma in 2006. Lester also spoke about Jason Varitek, and how it’s hard for him to imagine pitching to anyone else. He even wore his World Series championship ring to the university. Joba warned students about the dangers of drunken driving. Both of them answered questions and signed autographs for some of the young fans. Joba is headed down to Tampa tomorrow and is ready to start throwing off the mound “Twenty-five fastballs, I’m feeling great,” he said. The Yankees, he said, told him in November that he would be a starting pitcher and he has been preparing for that. “It’s a relief to have it all settled,” he said. Could Yanks’ land Mauer on the open market after 2010 season? Peter Gammons talks about Joe Mauer in his latest blog entry. He brings up the point that Mauer’s contract will be up after the 2010 season. He says if they don’t get an extension completed then there will be a big competition between the Yanks & Sox. This could certainly happen. The Red Sox don’t really have a catcher at the moment, as Varitek is still deciding on whether or not he will return. The Sox made an offer: The deal includes $5 million for this season with a $5 million team option or $3 million player option for 2010. On the other hand, the Yankees have Jorge Posada..who is signed through 2011. Posada won’t be able to play behind the plate at 39 years of age, so they will be able to move him. There is a lot of time until his contract is up, so there is a chance he won’t even hit the market. Only time will tell. This brings up a question though…what happens with Jesus Montero & Austin Romine? Memo to Twins CEO Jim Pohlad: Get Joe Mauer’s contract extension completed, because he will be the next great Yankees-Red Sox war if he hits the free-agent market in November 2010. The New York Yankees are tying to help out the Boys and Girls Clubs of Tampa Bay. They will be holding a luncheon at the Tampa Convention Center on March 24th, where some of the biggest Yankees stars will show up and sign autographs for the fans. The Yankees will put down their bats and pick up their pens again this spring, signing autographs to benefit the Boys & Girls Clubs of Tampa Bay on March 24. All of the Yankees’ biggest names — including Derek Jeter, Alex Rodriguez, CC Sabathia and Mark Teixeira — are scheduled to attend a luncheon, to be held at the Tampa Convention Center. Tickets are available for the event, which runs from 11:30 a.m.-1 p.m. ET. General admission tickets are priced at $300 per person. Guests are invited to bring jerseys, baseballs, photos and other items for autographs, with players and coaches available to sign one item per person. Official Major League baseballs and other items will also be available for sale that day. After the autograph signing period, the Yankees’ players and coaches will be introduced at the head table and lunch will be served. The event will conclude with a short program presented by the Yankees. Last year’s guests were treated to a video and a speech by club co-chairman Hal Steinbrenner. For more information on purchasing tickets to the Yankees luncheon, fans are invited to visit http://www.bgctampa.org. The Boys & Girls Clubs of Tampa Bay serve an average of 3,000 youths daily at their 22 clubs throughout Hillsborough and Pasco counties.